The workshop was kicked off by Valerie Egdell, Senior Research Fellow from the Employment Research Institute, Edinburgh Napier University. Valerie provided an overview of the demographic changes contributing to the ageing of the population. She outlined the legislative context that is driving the extension of working lives, including the rising state pension age and the abolishment of the default retirement age. Valerie discussed that while government has sought to encourage businesses to ‘retain, retrain and recruit’ older workers, research has consistently found a lack of systematic plans by businesses, to prepare and benefit from the demographic and labour market changes. Preconceptions and stereotypes about older workers persist, and may present barriers to older workers. Wendy Loretto, Dean of the Business School at the University of Edinburgh presented preliminary findings from two research studies: Uncertain Futures: Managing Late Career Transitions and Extended Working Life (ESRC/MRC funded) and Older People and Employment in Scotland (Scottish Government funded). Employers are aware of the ageing population and the need to retain older workers. However, Wendy argued that a retreat from the management of later working lives can be observed. The age discrimination legislation has made some employers fearful of taking any age-specific actions, especially discussing retirement. In this context employers increasingly discuss the ‘resignation’ of older workers, as opposed to ‘retirement’. Conversely, older workers themselves speak about retirement, not resignation. Age stereotypes about the benefits and disadvantages of an ageing workforce persist. While employers emphasise their flexible working offers, older workers may have patchy awareness of them, or may feel unable to ask to work flexibly. Jo Neary, Research Associate in Public Health at the University of Glasgow, presented findings from the SOPIE (Supporting Older People into Employment) research study. SOPIE aims to identify factors influencing return-to-work in the over 50s, and involves 26 unemployed over 50s who are in the first eight months of the Work Programme. The Work Programme is a UK government two-year welfare-to-work programme for 17 to 65 year olds. Richard Baker, Early Stage Dementia Team Leader at Age Scotland, outlined Age Scotland’s work on raising awareness of early stage dementia and the need to support people with dementia and carers at work. In Scotland, 90,000 people have dementia and 19% of adults in Scotland provide regular care to someone with dementia. Dementia is a workplace issue. 18% of people under the age of 65 with dementia in the UK continue to work after receiving a diagnosis of dementia. 93% of working carers in the UK report that looking after someone with dementia has affected their capacity to work. 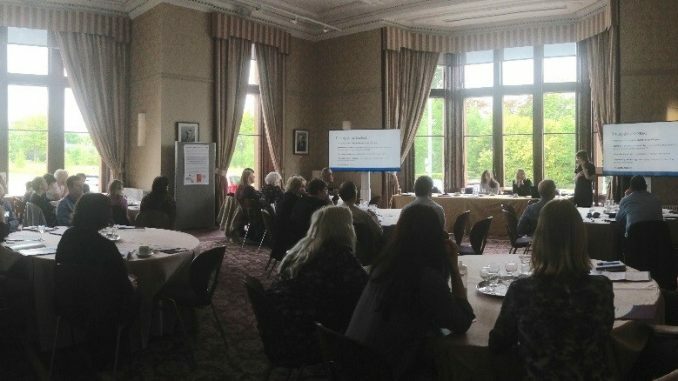 Age Scotland has delivered dementia awareness training in workplaces; worked in collaboration with the STUC, Alzheimer Scotland, academics and Scottish Government to organise a conference on dementia in the workplace; and has published a guide for employers on supporting employees and customers who have dementia. Terry Anderson, Union and Community Development Officer at the STUC, started by providing an overview of the STUC’s main areas of work: (1) employment rights support to union and non-union members; and (2) training and support to employability support organisations. Terry outlined the support available through the Support@Work project which operates in Edinburgh. He discussed some of key workplace issues faced by older workers (including phased returns to work, contractual rights and career development) and provided case studies of older worker experiences. Clare Frances Moran, Lecturer in Law at Edinburgh Napier University, asked the question of whether it is lawful for employers to still have an age-related policy in place. Clare Frances focused on retirement policies and provided an overview of situations where employers may set a retirement age. Retirement ages may be justified on objective grounds’: it must be in pursuit of a legitimate aim and must be proportionate. Clare Frances used examples from case law to show that while a retirement age is not necessarily illegal, a tribunal would assess the ‘proportionality’ of a measure. Vanessa Beck, Lecturer in Employment Studies at the University of Leicester, presented findings from research conducted alongside colleague Dr Glynne Williams (University of Leicester). Vanessa and Glynne’s research was undertaken with consultancy companies offering performance management systems. Vanessa discussed how, since the end of the Default Retirement Age, performance management systems have been used as a mechanism to ‘manage out’ older workers. She highlighted the continuous nature of these systems that gather multiple data and leave considerable room for management discretion and subjectivity. Consequently, the scope for discrimination is high. Vanesa Fuertes, Research Fellow at Employment Research Institute, Edinburgh Napier University, presented findings from research on age management in small and medium‐sized enterprises (SMEs). The research involved initial interviews with managers, HR personnel and older workers from six SMEs. Action research activities designed to raise awareness of age management issues and age discrimination legislation were then delivered to the managers and the HR personnel in the participating SMEs. Three to four months after the delivery of the awareness raising activities, follow‐up interviews were undertaken to ascertain if the activities had resulted in any changes in policy, practice and attitudes towards older workers. The research found that although the participating SMEs were aware of the demographic trends, their effect was regarded as very distant. Good practice in age management was found in the participating SMEs, but not as part of a systematic strategy. The research found that raising awareness of potential barriers in recruitment methods and the benefits of having an age diverse workforce did resonate with the participating SMEs. Susan Gimson, Health and Work Specialist at NHS Health Scotland, outlined the most common conditions affecting older workers. These include arthritis, cancer, heart disease, depression and diabetes. Susan provided an overview of good practice identified by the Chartered Institute of Personnel Development (CIPD) in supporting the health of older workers. Examples of good practice include: supporting employee health and well-being across demographics; investing in training and development that is based on potential, not age; and embracing the retention benefits (and talent attraction) of flexible working. There are a number of benefits in supporting the health of older workers. Providing support at an early stage can improve employee’s response to working with their condition. Older workers will feel supported and valued resulting in a more motivated and productive workforce. Equally, a business’ reputation and profile may be enhanced. There is a need to focus more on the benefits of employing older workers. The workshop was funded by Edinburgh Napier Business School Public Engagement and Innovation Funding 2016-2017. The workshop was organised by Dr Valerie Egdell and Vanesa Fuertes from the Employment Research Institute, Edinburgh Napier University.